Make hot cocoa. Bundle up. Tell your friends: the best meteor shower of 2004 is about to peak on a long cold December night. It's the Geminids. The best time to look is Monday night, Dec. 13th. Sky watchers who stay outside for a few hours around midnight can expect to see dozens to hundreds of "shooting stars." The source of the shower is asteroid 3200 Phaethon. There's a cloud of dust trailing the asteroid and Earth plows through it every year in mid-December. Bits of dust traveling 80,000 mph hit our atmosphere and turn into glowing meteors. 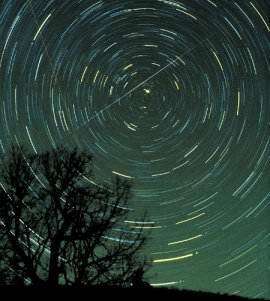 Image: Star trails and a Geminid meteor over Brasstown Bald mountain, Georgia, in 1985. Credit: Jimmy Westlake. Where should you look? Anywhere. Geminids streak all over the sky. Trace some backwards: they all lead to a radiant point in the constellation Gemini. This year the radiant lies next to Saturn--a beautiful coincidence. Gemini and Saturn are high overhead at midnight, easy to find. City lights are bad for meteor showers. The glare can reduce the number of meteors you see 3- to 10-fold. Consider taking a trip to the countryside. Because the Moon is almost new on Dec. 13th, country skies are going to be very dark and perfect for meteor watching. Although the middle of the night is (probably) best, start looking for Geminids as soon as the sun goes down. The first dark hours after sunset are when Earthgrazers appear. Earthgrazers are meteors that skim almost horizontally across the top of Earth's atmosphere, like a stone skipping across a pond. You might see a few between 5:00 p.m. and 7:00 p.m. local time when Gemini is first peeking over the eastern horizon (the perfect geometry for earthgrazing). Earthgrazers are bright, long and colorful. Even one can make your day. Finally, the Geminids are a little strange. It's their parentage: 3200 Phaethon. Meteor showers are supposed to come from comets, but 3200 Phaethon looks like an asteroid. This has puzzled astronomers for years. Comets are made of ice and dust and rock. Sunlight vaporizes the ice, opening fissures which spew gas and dust into space. This is why comets have tails. When Earth runs into an old comet tail we see a meteor shower. Asteroids, on the other hand, are mainly rocky and they rarely spew anything. No tail means no shower. Asteroid 3200 Phaethon might have gotten a tail, of sorts, by bumping into another asteroid. 3200 Phaethon spends much of its time in the asteroid belt. Hitting a neighbor could have created a cloud of debris that follows 3200 Phaethon around the solar system. That's one idea. Another is that 3200 Phaethon is a comet--a dead one. It died from too much Sun. Every year and a half, 3200 Phaethon dives inward from the asteroid belt. Passing only 2 million miles from Earth's orbit, it approaches the Sun closer than Mercury does. Repeated sunbaking could have vaporized all of 3200 Phaethon's ice long ago, leaving behind a rocky skeleton with a dribble of comet dust in its wake. Comet? Asteroid? Comet-carcass? No one knows for sure. It's a mystery to savor on Dec. 13th … with hot cocoa at your side and the Geminids overhead. Note: This story is written for northern-hemisphere observers, but Geminids are visible all over the world. As seen from the southern hemisphere, Gemini hangs lower in the sky and meteor rates are reduced by factors of 2 or 3. Otherwise, the story is the same.